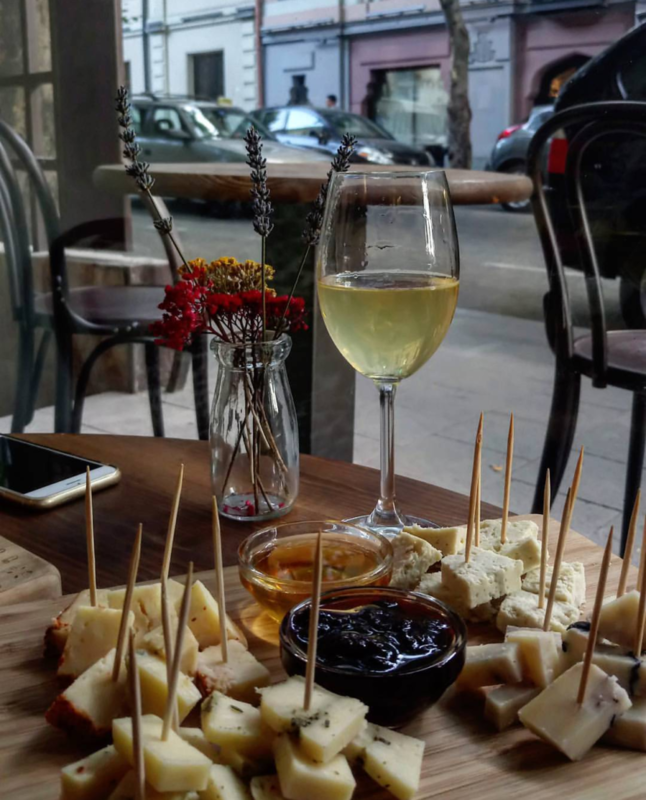 Once my mum asked me what I was doing, and I sent her a snapshot of me sitting in the newly opened wine bar in Kutaisi with a glass of Krakhuna (crispy local white wine) in front of me. “Does your hand ever rest from holding a glass?”, mum joked, but the joke had a taste of homemade Tsolikouri: it was straight, honest and not very clear at the same time. But what can I do? 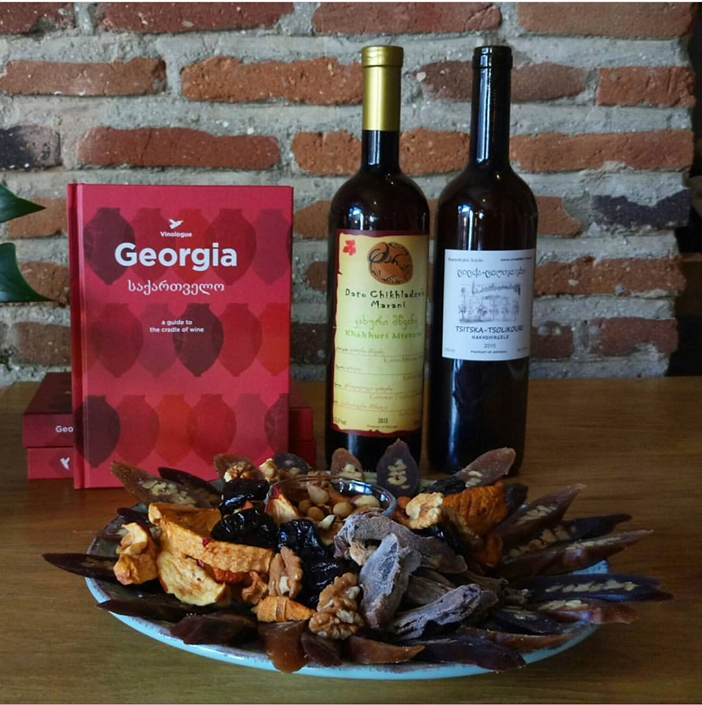 That was her and my dad who took me to my first tastings in Ukraine, and now, as I live in Georgia, level of my interest to wine almost reached the ISS – especially after I became Miquel Hudin’s co-author of a wine guide to Georgia. 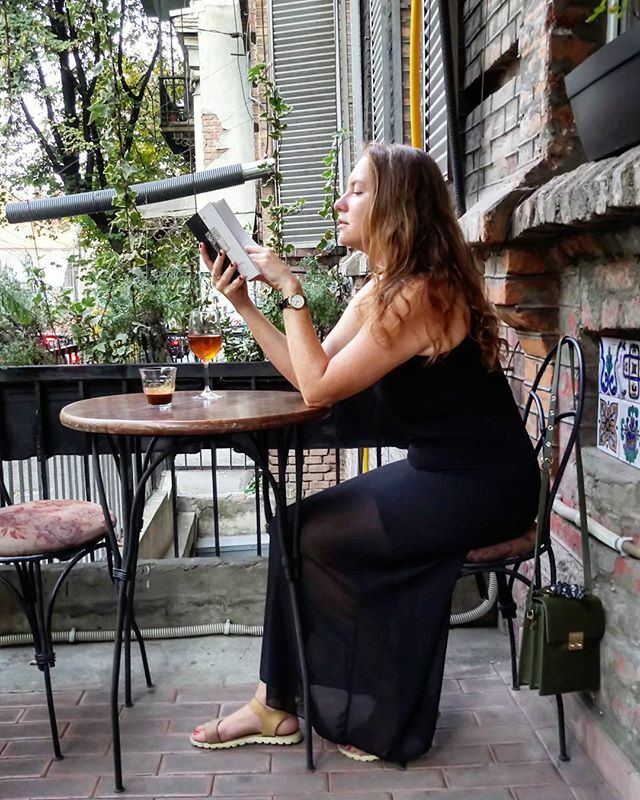 So, dear readers, let me share with you my favourite places to drink wine in Tbilisi – if you still didn’t get spammed enough by my instagram revelations. The list of favourite places across the country will follow! Opened in 2017 by two Russians who have huge experience in HoReCa field and are in love with Georgian wine culture, Dadi Bar is the place where I come to work on weekends sometimes. I usually take a table near the window, always with seasonal flowers on it, order a glass of something suitable to the weather and mood (Sasha, the co-founder, can always guess what I want) and write another text… Sometimes I indulge myself to a slice of Saperavi cake or plum tart – Dina, the other co-founder, invents truly delicious things! Amber is the colour of Georgian white wines prepared according to the traditional technology. And Amber Bar is one of the locations I choose for drinking those wines. They have their own white and red, and a long profound list of local producers. 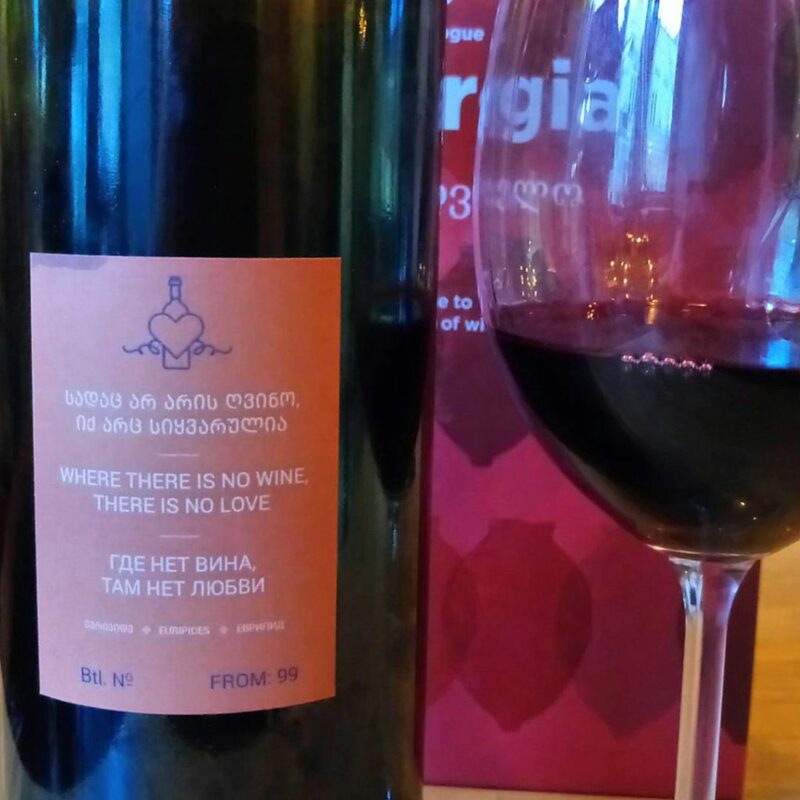 Among those, I would recommend picking the wines by Nikoladzeebis Marani and Kortaveebis Marani. Georgian and international cheese plates, mussels, crockets and hummus are the appetizers that I usually choose as companions to my wine selection. 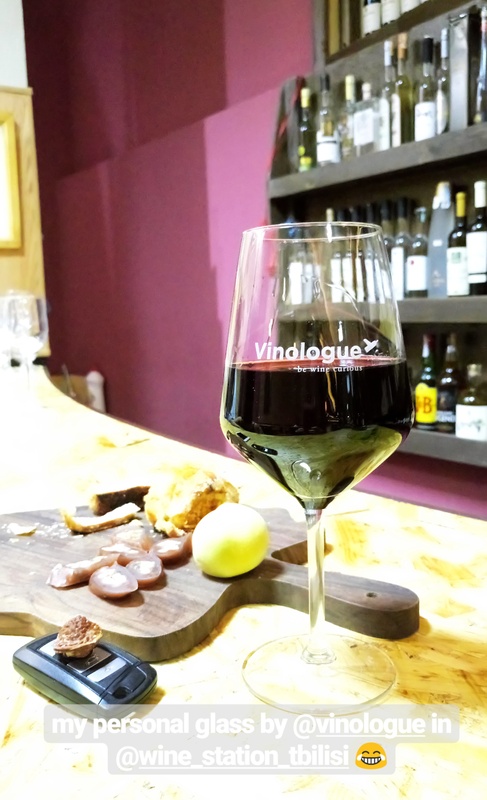 I started frequenting Café Volver quite recently, as they started serving not just the well known (and quite expensive) wines, but also decent wines on tap from the little regional producers. I prefer Rkatsiteli and Saperavi from Temi Community in Gremi village – Rkatsiteli tastes very intense and smells a bit like pear jam. But you can also enjoy the wines by DoReMi and Peasant’s Tears there. They have also revised the menu, and as the person who doesn’t eat meat, I am cheering about rare cheese Mutschli from Adigeni village (produced at the altitude of 2200 m), vegetarian tapas and homemade pesto. 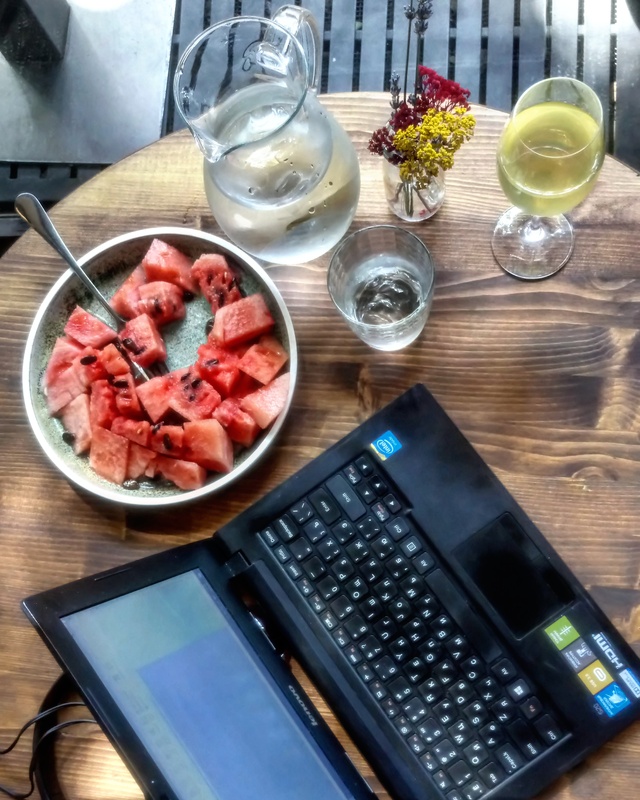 Plus, I love sitting on the terrace (when the weather is good; and it is still good when I am writing it!) and observe people of Sololaki area or read the book. Totally enjoyable! If Black Dog Bar is my second home, Wine Station is my second second home. Lazo, the owner of the place, has occupied the uncle’s role in my life, and I’m always happy to visit him, taste some new catch he brought from the regions and see him entertaining his guests. Usually there are just wines and basic things like various cheeses, fresh bread, fruits and churchkhela, but if you are hungry, Lazo will order something you would like to from the restaurant nearby. I was very skeptical about the first location – it is super touristic! But every time I go there, I see only Georgians and a couple of internationals. It definitely means that the price/quality balance is kept well! You can sample some wines before drinking them. There are also a lot of wines that are sold for super democratic prices – and taste well enough for this category. Combine them with cheese or nuts, and enjoy your evening! I hope you know that already in the 6 century BC the ancestors of modern Georgians were cultivating grapes and making wine in qvevri? 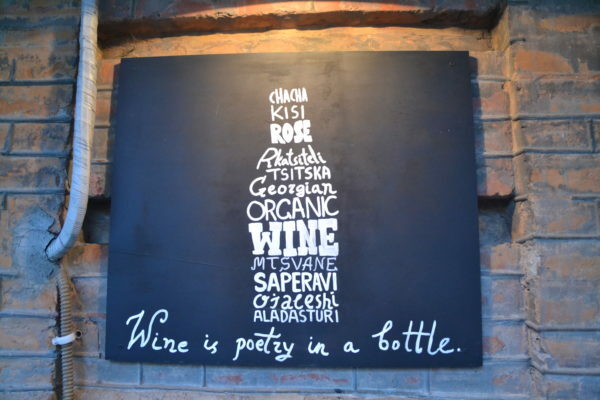 This bar/shop aims at bottling and corking all 8000 years of winemaking in several square meters. And I like the way they do it! Also: very democratic prices, but you can find expensive and rare wines too. Snacks and basic dishes that are combineable with wine are also in the menu. But the coolest thing is tastings and master classes they conduct. Very useful!